Personal Health Calendar Feeds and a Social Care Annunciator? Over the last few weeks and months I’ve started pondering all sorts of health and care related stuff that may help when trying to support family members a couple of hundred miles away. One of the things we picked up on was a “friendly” digital clock display (often sold as a “dementia clock” or “memory loss calendar”), with a clear screen, and easy to read date and time. The clock supports a variety of daily reminders (“Take your pills…”) and can also be programmed to display images or videos at set dates and times (“Doctor’s today”). One of the things this reminded me of was the parliamentary annunciators, that detail the current activity in the House of Commons and House of Lords, and that can be found all over the parliamentary estate. what if I could send a short text message or reminder to the screen via SMS? what if I could subscribe to a calendar feed from the device that could be interpreted to generate a range of alerts leading up to an event (*”Doctor’s tomorrow morning”*, *”Hospital this afternoon at 2pm”*). In short, it seems that the hospital doesn’t seem to have a calendar associated with each patient. family members looking to support the patient. So I imagine a situation where a patient books a GP appointment, and the receptionist adds it to the patient’s personal calendar. A hospital appointment is generated by a consultant and, along with the letter informing the patient of the date, the event is added to the patient’s calendar (possibly with an option to somehow acknowledge it, confirm it, cancel it?). A patient asks the GP to add a family member to the calendar/calendar feed so they can also access it. A range of privacy controls allow different parts of the health and social care system to request/make use of read access to a patient’s health and social care calendar. Hmmm…thinks… is this sort of thing has this sort of thing being explored (or has it been in the past? ), or maybe considered at an NHS Hack Day? Or is it the sort of thing I could put together as an NHS tech funding pitch? PS Some of the features of the Amazon Show could also work well in the context of a health/care annunciator, but… the Amazon Show is too feature rich and could easily lead to feature creep and complexity in use; I’d have “privacy concerns” using the Amazon backend and always on Alexa/Echo mic. Author Tony HirstPosted on July 19, 2017 July 19, 2017 Categories Anything you want, Thinkses5 Comments on Personal Health Calendar Feeds and a Social Care Annunciator? Fragments – Should Algorithms, Deep Learning AI Models and/or Robots be Treated as Employees? Ever ones for pushing their luck when it comes to respecting codes, regulations, and maybe even the law, Uber hit the news again last when it turned it out at least one of its automated vehicles was caught running a red light (Uber blames humans for self-driving car traffic offenses as California orders halt). My first thought on this was to wonder who’s nominally in control of an automated vehicle of the vehicle itself detects a likely accident and quickly hands control over to a human driver (“Sh********t… you-drive”), particularly if reaction times are such that even the most attentive human operator doesn’t have time to respond properly. My second was to start pondering the agency associated with an algorithm, particularly a statistical one where the mapping from inputs to outputs is not necessarily known in advance but is based on an expectation that the model used by the algorithm will give an “appropriate” response based on the training and testing regime. In the UK, companies can be registered as legal entities; as such, they can act as an employer and become “responsible” for the behaviour of their employees through vicarious liability ([In Brief] Vicarious Liability: The Liability of an Employer). Vicarious liability does not apply to all staff. As a general rule, a business can be vicariously liable for actions of employees but not actions of independent contractors such as consultants. (ii) which business the employee is more integrated into. Similarly, vicarious liability does not apply to every wrongful act that an employee carries out. A business is only vicariously liable for actions that are sufficiently close to what the employee was employed to do. Findlaw (and others) also explore limitations, or otherwise, to an employer’s liability by noting the distinction between an employee’s “frolics and detours”: A detour is a deviation from explicit instructions, but so related to the original instructions that the employer will still be held liable. A frolic on the other hand, is simply the employee acting in his or her own capacity rather than at the instruction of an employer. In addition, the briefing describes how “Although vicarious liability is predominantly a common law concept, for the purposes of anti-discrimination law, it is enshrined in statute under section 109 Equality Act 2010. This states that anything that is done by an individual in the course of his employment, must be treated as also done by the employer, unless the employer can show that it took all reasonable steps to prevent the employee from doing that thing or from doing anything of that description. So, I’m wondering… Companies act through their employees and agents. To what extent might we start to see “algorithms” and/or “computational models” (eg trained “Deep Learning”/neural networks models) starting to be treated as legal entities in their own right, at least in so far as they may be identified qua employees or agents when it comes to acting on behalf of a company. When one company licenses an algorithm/model to another, how will any liability be managed? Will algorithms and models start to have their own (employment) agents? Or are statistical models and algorithms (with parameters set) actually just patentable inventions, albeit with very specifically prescribed dimensions and attribute values? In terms of liability, companies currently seem keen to try on wriggling around accountability by waving their hands in the air when an algorithm occurs. But when does the accountability lie, and where does the agency lie (in the sense that algorithms and models make (automated) decisions on behalf of their operators? Are there any precedents around ruling decision making algorithms as something akin to “employees” when it comes to liability? Or companies arguing for (or against) such claims? Can an algorithm be defined as a company, with its articles and objects enshrined in code, and if so, how is liability then limited as far as its directors are concerned? I guess what I’m wondering is: are we going to see algorithms/models/robots becoming entities in law? Whether defined as their own class of legal entity, companies, employees, agents, or some other designation? PS pointers to case law and examples much appreciated. Eg this sort of thing is maybe relevant? Search engine liability for autocomplete suggestions: personality, privacy and the power of the algorithm in a discussion of how an algorithm operator is liable for the actions of the algorithm? Now that I’ve got a couple of my own WordPress blogs running off the back of my Reclaim Hosting account, I’ve started to look again at possible ways of tinkering with WordPress. The first thing I had a look at was posting a draft WordPress post from a script. posts: the timestamped elements that appear in a reverse chronological order in a WordPress blog. Posts can also be tagged and categorised and viewed via a tag or category page. Posts can be ‘persisted’ at the top of the posts page by setting them as a “sticky” post. pages: static content pages typically used to contain persistent, unchanging content. For example, an “About” page. Pages can also be organised hierarchically, with child subpages defined relative to a specified ‘parent’ page. sidebar elements and widgets: these can contain static or dynamic content. Within a page or a post, we can also include a shortcode element that can be used to include a small piece of templated text or generated from the execution of some custom code (which it seems could be python: running a python script from a WordPress shortcode). Shortcodes run each time a page is loaded, although you can use the WordPress Transients database API to implement a simple cache for them to improve performance (eg as described here and here). When we put together the Isle of Wight planning applications : Mapped page, one of the issues related to how updates to the map should be posted over time. That is, should the map be uploaded to a fixed page and show only the most recent data, should it be posted as a timestamped post, to provide archival copies of the page, or should it be posted to a page and support a timeslider/history function? It also strikes me that we need to consider publication schedules by a news outlet compared to the publication schedules associated with a particular dataset. For example, Land Registry House Prices Paid data is published on a monthly basis a few weeks after each month the data has been collected for. In this case, it probably makes sense to publish on a monthly basis. publish summaries of reports over the last week or last month, on a weekly or monthly schedule – “The CQC published reports for N care homes in the region over the last month, of which X were positive and Y were negative”, etc. engage in a more immediate or responsive publication of stories around particular reports as they are published by the responsible agency. In this case, the journalist needs to find a way of discovering stories in a timely fashion, either through signing up to alerts or inspecting the agency site on a regular basis. Again, it might be that we can use posts and pages in complementary way: pages that act as fixed destination sites with a fixed URL, and perhaps links off to archived historical sub-pages, as well as related news stories, that contain the latest summary; and posts that announce timely reports as well as ‘page updated’ announcements when the slower-changing page is updated. More abstractly, it probably makes sense to consider the relative frequencies with which data is originally published (also considering whether the data is published according to a fixed schedule, or in a more responsive way as and when data becomes available), the frequency with which journalists check the data site, and the frequency with which journalists actually publish data related stories. Automated content generators, aka robot journalists, are turning everywhere at the moment, it seems: the latest to cross my radar being a mention of “Dreamwriter” from Chinese publisher Tencent (End of the road for journalists? Tencent’s Robot reporter ‘Dreamwriter’ churns out perfect 1,000-word news story – in 60 seconds) to add to the other named narrative language generating bots I’m aware of, Automated Insight’s Wordsmith and Narrative Science’s Quill, for example. Although I’m not sure of the detail, I assume that all of these platforms make use of quite sophisticated NLG (natural language generation) algorithms, to construct phrases, sentences, paragraphs and stories from atomic facts, identified story points, journalistic tropes and encoded linguistic theories. One way of trying to unpick the algorithms is to critique, or even try to reverse engineer, stories known to be generated by the automatic content generators, looking for clues as to how they’re put together. See for example this recent BBC News story on Robo-journalism: How a computer describes a sports match. Chatting to media academic Konstantin Dörr/@kndoerr in advance of the Future of Journalism conference in Cardiff last week (I didn’t attend the conference, just took the opportunity to grab a chat with Konstantin a couple of hours before his presentation on the ethical challenges of algorithmic journalism) I kept coming back to thoughts raised by my presentation at the Community Journalism event the day before [unannotated slides] about the differences between what I’m trying to explore and these rather more hyped-up initiatives. In the first place, as part of the process, I’m trying to stay true to posting relatively simple – and complete – recipes that describe the work I’m doing so that others can play along. Secondly, in terms of the output, I’m not trying to do the NLG thing. Rather, I’m taking a template based approach – not much more than a form letter mail merge approach – to putting data into a textual form. Thirdly, the audience for the output is not the ultimate reader of a journalistic piece; rather, the intended audience is an intermediary, a journalist or researcher who needs an on-ramp providing them with useable access to data relevant to them that they can then use as the possible basis for a story. In other words, the space I’m exploring is in-part supporting end-user development / end user programming (for journalist end-users, for example), in part automated or robotic press secretaries (not even robot reporters; see for example Data Reporting, not Data Journalism?) 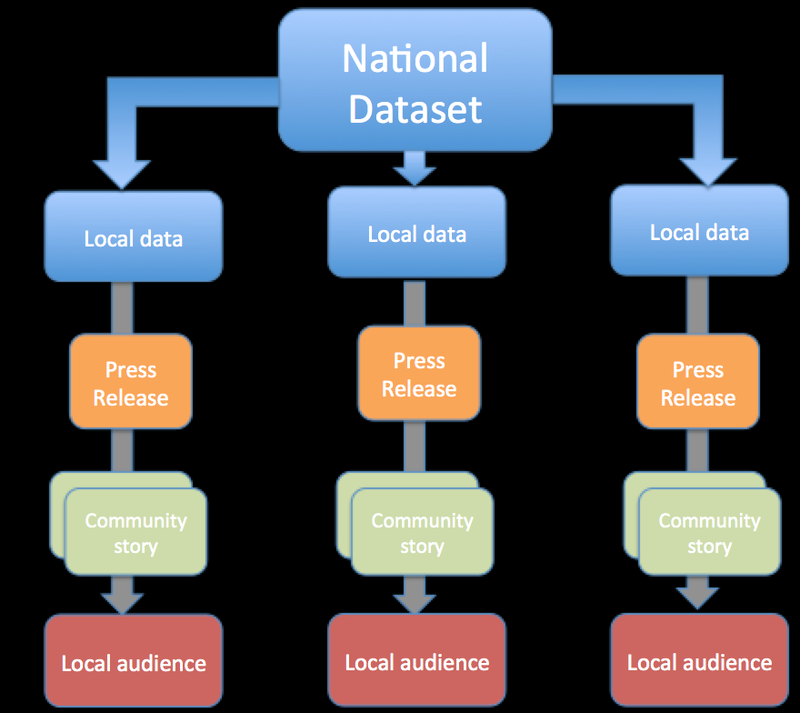 – engines that produce customised press releases from a national dataset at a local level that report a set of facts in a human readable way, perhaps along with supporting assets such as simple charts and very basic observational analysis (this month’s figures were more than last month’s figures, for example). the similarity in form of one report to another is not likely to be a distraction to the journalist in the way that it would be to a general public reader presented with several such stories and expecting an interesting – and distinct – narrative in each one. Indeed, the consistent presentation might well aid the journalist in quickly spotting the facts and deciding on a storyline and what contextualisation may be required to add further interpretative value to it. targeting intermediary users rather than end user: the intermediary users all get to add their own value or style to the piece before the wider publication of the material, or use the data in support of other stories. That is, the final published form is not decided by the operator of the automatic content generator; rather, the automatically generated content is there to be customised, augmented, or used as supporting material, by an intermediary, or simply act as a “conversational” representation of a particular set of data provided to an intermediary. The generation of the local datasets rom the national dataset is trivial – having generated code to slice out one dataset (by postcode or local authority, for example), we can slice out any other. The generation of the press releases from the local datasets can make use of the same template. This can be applied locally (a hyperlocal using it’s own template, for example) or centrally created and managed as part of a datawire service. At the moment, the couple of automatically generated stories published with OnTheWight have been simple fact reporting, albeit via a human editor, rather than acting as the starting point for a more elaborate, contextualised, narrative report. But how might we extend this approach? In the case of Jobseeker’s Allowance figures, contextualising paragraphs such as the recent closure of a local business, or the opening of another, as possible contributory factors to any month on month changes to the figures, could add colour or contextualisation to a monthly report. But I guess we have to start somewhere! And that somewhere is the simple (automatically produced, human copy edited) reporting of the facts. PS in passing, I note via Full Fact that the Department of Health “will provide press officers [with an internal ‘data document’] with links to sources for each factual claim made in a speech, as well as contact details for the official or analyst who provided the information”, Department of Health to speed up responses to media and Full Fact. Which gets me thinking: what form might a press office publishing “data supported press releases” take, cf. a University Expert Press Room or Social Media Releases and the University Press Office, for example? Writing Each Row of a Spreadsheet as a Press Release? A few days ago, I saw via the @HSCICOpenData Twitter feed that an annually released dataset on Written Complaints in the NHS has just been published. The data comes in the form of a couple of spreadsheets in which each row describes a count of the written complaints received and upheld under a variety of categories for each GP and dental practice, or local NHS trust. Each practice is identified solely by a practice code – to find the name and address of the actual practice requires looking up the code in another dataset. The column headings supplied in the CSV document only partially identify each column (and indeed, there are duplicates such as Total number of written complaints received, that a spreadsheet reader might disambiguate by adding numerical suffix to) – a more complete description (that shows how the columns are actually hierarchically defined) is provided in an associated metadata spreadsheet. for each of those practices, look along the row to see whether or not there are any large numbers in the complaints upheld column. But if you have a spreadsheet with 10, 20, 30 or more columns, scanning along a row looking for items of interest can rapidly become quite a daunting task. So an idea I’ve been working on, which I suspect harkens back to the earliest days of database reporting, is to look at ways of turning each row of data into a text based, human readable report. Each record, each “Complaint Report”, is a textual rendering of a single row from the practice complaints spreadsheet, with a bit of administrative metadata enrichment in the form of the practice name, address (and in later versions, telephone number). These reports are quicker to scan, and could be sort or highlighted depending on the number of upheld complaints, for example. The journalist can then quickly review the reports, and identify any practices that might be worth phoning up for a comment to ask why they appear to have received a large number of upheld complaints in a particular area, for example… Data driven press releases used to assist reporting, in other words. FWIW, I popped up a sketch script that generates the above report from the data, and also pulls in practice administrative metadata from an epracurr spreadsheet, here: NHS complaints spreadsheet2text sketch. See also: Data Driven Press Releases From HSCIC Data – Diabetes Prescribing. PS I’m not Microsoft Office suite user, but I suspect you can get a fair way along this sort of process by using a mail merge? There may be other ways of generating templated reports too. Any Microsoft Office users fancy letting me know how you’d go about doing something like the above in Word and Excel? I’d guess complicating factors are the requirements to make use of the column headers and only display the items associated with non-zero counts, which perhaps requires some macro magic? Things could perhaps be simplified by reshaping the data, perhaps putting it into a long form by melting the complaints columns, or melting the complaints columns cannily to provide two value columns, once for complaints received and one for complaints upheld? Then you could filter out the blank rows before the merge.